For manufacturing plants, process improvement is always an important consideration. Orbis was contracted by a battery manufacturing facility to develop a LabVIEW software application to automate data collection for end-of-line battery testing. The previous method required operators to gather battery test data manually using benchtop instrumentation, and subsequently record data manually using a variety of cumbersome forms. To significantly improve the process, Orbis developed a custom serial interface driver to communicate with a Hioki 3560 AC mΩ HiTester meter to automate the collection of voltage and resistance battery test measurements. The Hioki HiTester is a contact-resistance meter capable of providing quick and accurate measurements for the contact resistance of switches and relays, as well as the internal resistance and open-circuit voltage of batteries. The automated measurement interface alleviated the need for operators to manually measure and record battery test data. 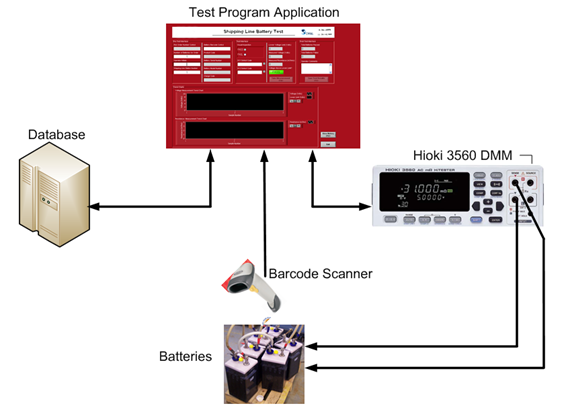 For battery testing, a custom LabVIEW based software application was created. 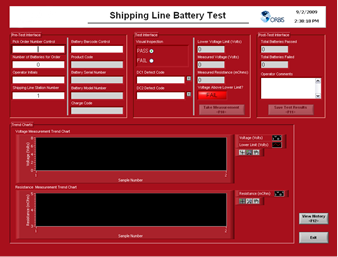 The Shipping Line Battery Test screen included provisions for entering battery testing information including order number, visual inspection results, defect codes, and operator initials. The screen also included charts for displaying trend data for resistance and voltage measurements, and indicators for dynamically tracking the number of batteries tested for a particular order in addition to the pass/fail count. After scanning the battery serial number with the integrated barcode scanner and acquiring measurements, the intuitive user interface displayed test results and indicated whether or not the results were within limits. The operator could then choose to retest the battery, or record the results. Finally, to overcome having to manually track battery testing results for battery shipments, Orbis developed an SQL server interface that communicated with the customer’s internal database. The SQL server interface allowed for automated storage and retrieval of information including order number, battery serial number, battery test data, pass/fail status, operator comments, and a date and time stamp. 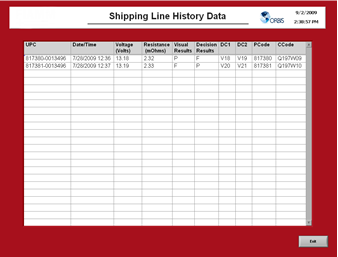 In addition to the Shipping Line Battery Test screen, the software included a Shipping Line History Data screen that allowed the operator to view information from the central database. 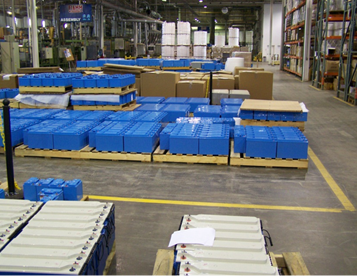 The battery test system was deployed across multiple end-of-line shipping stations. The end result was a significantly improved process for efficiently testing batteries and tracking vital production information.